I wanted to share my last layout I created as the October guest designer for Chickaniddy, using their new Scrumptious collection. 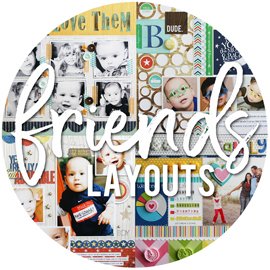 I worked with their October sketch for this layout, which went up on their blog last week. I love a good sketch, and this one worked so well with my style. Every now and then, I'll be given a sketch to work with, and my first thought is "what am I going to do with that?". Lol. It's always nice when a sketch goes hand in hand with your style. I usually follow sketches pretty closely, since I love having the work done for me, but I like that they still give me the freedom to change it up a bit to fit my needs. I knew I wanted to include a larger focal point photo on my page, so I added in a 4x6" photo in the upper left corner and moved my title to the bottom right corner of the page. I also eliminated the tag, with the journaling, since I didn't want anything covering my main photo. I am a big fan of using 2x3" photos on my pages, along with a larger photo, so I loved that this sketch had room for several smaller photos. I printed out four smaller photos, just like the sketch shows, but I really went back and forth on using them all, or just two or three of them. While the Scrumptious collection might not have been my first pick to go with these photos I took of my cousin and his family, I love that the denim patterned paper in the collection really tied in with the photos. From there, it felt natural to incorporate the rest of the gorgeous colors in this collection, even though at first glance, they wouldn't have been something I'd have grabbed. I want to thank Heidi and Pam again for inviting me to guest design for them this month. It was a true pleasure! 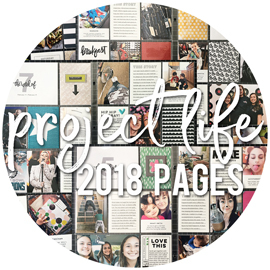 Once a month, over on the Bella Blvd blog, we do a "Trends" feature where I choose something that's trending in paper crafting (scrapbooking, card making, etc) and a few of our design team members incorporate that trend into their projects. 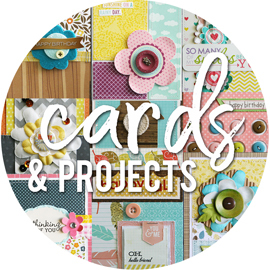 This month, I decided to focus on hand cut titles and/or sentiments (for my card designer). I've been seeing a ton of hand cut titles lately, in all different shapes and sizes. I love the ones with the big, chunky letters, each cut from a different patterned paper. It adds such a fun feel to the page. I'm not sure how others go about cutting these letters. Just randomly cutting away with scissors? Drawing the letters first, and then cutting them out? Using a hand drawn alpha cut file and "cutting" them out with a die cut machine? All great ideas, I'm sure. I know myself and I know that I cannot just randomly start cutting into paper and end up with cool looking letters. I have to plan things out. I had envisioned creating my entire title using hand cut letters, and using a variety of patterned papers. In the end, I decided to only use hand cut letters for one word of my title, and use chipboard alphas for the rest of the title. Once I had my chipboard alphas all arranged on the page, I knew how much room I had left to fit in my hand cut letters. I knew I was cutting the word "wings", so I placed a sheet of tracing paper over the page, and simply wrote the word "wings" to get the sizing right. Then I used a pencil to sketch out the shape of each letter, erasing and re-sketching as needed. Once I had them looking fairly decent, I cut each letter out from the tracing paper. I flipped them over and traced them onto the backside of my patterned paper. One reason being that I was using a dark brown woodgrain patterned paper, so it would have been hard to see my tracing. The other reason was that I didn't have to worry about cutting inside the lines, since when I flipped over my letters, any pencil marks left wouldn't show. Since the base of my page is pretty simple (little bit of patterned paper, white cardstock background), I knew I needed to add a little something-something to the page to spruce it up. Bella's feathers are easy to add to projects, and don't add too much bulk, which is nice. And they definitely add some interest. It also felt like they just "fit" on the page, since my title involved wings and flying. I tucked two feathers under my photo, so that just the ends were sticking out. I didn't want to overwhelm my title too much, so I just wanted the feathers to peek out a little. Once I added the feathers to the right side of the page, I felt like I needed to add some on the left side to balance it out. That was a little trickier, since I hadn't left myself much room to work with. I ended up putting a good amount of adhesive along the edge of the cardstock and pressing my feathers in place really well. I put adhesive all along the patterned paper strip as well, and pressed that down on top of the feathers really well too. Then I trimmed off what was hanging off the edge. Not necessarily perfect, but it worked for the most part. I finished off the page with some wooden buttons and a few enamel dots. Oh, and some journaling about my gorgeous girl. I actually had more that I wanted to say, but since I didn't really leave myself much room (journaling is almost always the last thing I think about), I kept it short and sweet. 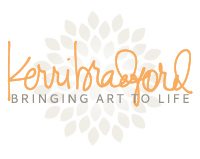 I have a new layout up at Kerri Bradford Studio today. I had a pretty good idea that I was going to scrap these photos of Mateo for my next layout for Kerri. Whenever I'm printing photos at home, and have space left on the page, I just print out random photos that I think I might want to scrap at some point. And in between printing photos out for numerous other projects, and adding one of these photos each time, I finally ended up with three photos to use on a page. But then Kerri came out with her new All About Fall kit, and I really wanted to use it, seeing as it's fall and all. Except that we don't really have "fall" here where I live (I'm positive that I've mentioned this 842 times before!). The kit has great words for pumpkin patch layouts and Halloween layouts, but I've scrapped my "good" pumpkin patch and Halloween photos to death. Any older ones that might still need scrapping are from the film days, and would involve seaching for negatives and having re-prints made. Too much work. After looking at this kit a few times, the word "wicked" caught my eye. It dawned on me that I could use it along with the photos of Mateo. I came up with the title "wicked cute dude", which fits him perfectly. Because he is seriously the cutest little boy ever! We've been loving on his cuteness, since he first started coming to our daycare when he was just a few months old. And he's only gotten cuter and cuter as he's gotten older. I still can't believe he's going to be 3 years old in a few weeks! I took the word "dude" from the Urban Dictionary kit, and used Kerri's Weathered Door Alphabet [All] kit to create the word "cute". The Weathered Door alphas are still a favorite of mine, since I can do my favorite combo of a script or hand drawn word and a chunky block font for my titles. I wasn't really sure what I would do when it came time to pick out patterned papers, which is where I usually start my layouts. Two of the photos have a lot of color going on, since I took these photos looking down on Mateo, playing with our Little People toys. For whatever reason, I pulled out my Plus One collection from Amy Tan first, and decided that I loved the aqua, orange, grey and black color combo with the photos. These star stickers came about very randomly. I've been doing a little purging in my scraproom lately, and just last week I cleaned out a few baskets of stickers and rub-ons. I have some super old stuff that I just can't seem to part with. But I also never think to use them, as I don't often take the time to dig thru my stash when sitting down to create layouts. As I was cleaning, I came across these old Sassafrass stickers, and while most of the stickers on the sheet are ones I would never use, these two star stickers matched my papers, so I decided to use them. And if you look at the first detail shot I shared, you'll see I used a cloud sticker from the same sticker sheet. I didn't think it matched as well, but decided to use it anyways. I added a few black enamel dots to distract from the "tape" on the sticker that I felt was distracting. I love that Kerri has a huge variety of kits loaded up with hand drawn words, script words, cursive words, as it's so easy to find just the mix you're looking for, for any given project. You can find the majority of her kits containing her handwritten words right HERE. Our October project sheet went up on the Bella Blvd blog today, featuring our new Halloween Magic collection. I've been creating these monthly project sheet layouts for over three years now, so this is actually the forth Halloween project sheet layout I've done for Bella. Add in all of the Bella Halloween layouts I've created for CHA's, catalog work, and other promotions, and it's no wonder that you keep seeing the same Halloween photos on these layouts. Lol. I created this layout right after working on a layout for another assignment (for something non-Bella), where I had used lots of small squares of photos and papers. I knew right away that I wanted to go with the same small squares in my design, which would be a great way to use lots of the fun patterned papers in this collection. I added a 12" strip of the grey woodgrain patterned paper across the page, keeping it the same height as my small squares, to hold my title. The Chipboard Icons package has these colorful "Halloween" alphas, and then I used the black number stickers from the Treasures & Text sticker sheet. I added some chipboard embellishments and stickers to some of the patterned paper squares. To add a little more interest to the squares, I added some random machine stitching to some of them, before adhering the embellishments. I love the green and white against the black polka dotted background paper. I used my favorite scalloped border punch on the green star patterned paper to create four border strips. I trimmed them down so they were just a tad bit shorter than the width of my white cardstock, and then tucked them under the edges before machine stitcking around the outside edge of the white cardstock. To download our October step-by-step project sheet, with complete supply list and detailed instructions, click HERE. I wanted to share the second layout I created as the October guest designer for Chickaniddy, using their new Scrumptious collection. When I was digging around for photos, I came across these ones I took way back when, of one of my first little daycare boy and his brother. I'm still close with their family, so it's fun to look back on these photos, knowing that little Sam is now a full eight years older than in these photos! I love when themed collections have lots of basic patterns, like the polka dots, stars, and stripes, as they are super versatile to use. I cut a piece off of three of the patterned papers, distressed the edges, and machine stitched each piece. For the forth patterned paper, which was more of a solid burnt orange, I die cut a piece using my Cameo, and spritzed it with white misting spray. I like how the die cut piece, mixed in with the other pieces of patterned paper, add a fun little touch. Once I had lined up my photos across the center of the page, I adhered the four patterned paper pieces, tucking them under the tops of the photos. I trimmed one of the 3x4" journaling cards off one of the patterned papers, and added it along with the photos. My photos must have printed out a little shy of 3" wide, since when I lined them all up, I had a small gap. I solved that problem by adding a thin strip of the mustard paper to the side of the journaling card and machine stitching it in place. I die cut my title using my Cameo, using the more solid pieces of paper. I really liked the denim patterned paper, but had used so much of it on my third layout (coming later this month). I didn't have a 12" long piece to trim for borders, so I just cut lots of smaller pieces and pieced them together to create my borders. Check back later this month to see my third layout, using this same collection. Hey everyone! If you haven't heard yet, today is World Card Making Day. I had a card go up over on the Scrapbook & Cards Today blog early this morning, and wanted to share it here too. I picked out a sketch from the new Card Maps 4 issue, and created my card based off that. You can check out the sketch over on their blog. Maybe it's because I've been working with Bella Blvd's Snapshots fabic collection all week, but my mind immediately went to our Snapshots paper collection for this card. 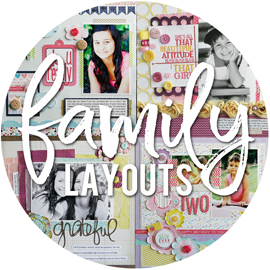 You should definately take some time to visit the Scrapbook & Cards Today blog today. There has been posts going up every hour, on the hour all day long. There are 17 posts in all, with amazing giveaways every single hour. You have until Friday, October 17th to leave comments and get in on a chance to win some fun goodies. Riley Blake Designs recently released a new fabric line by Bella Blvd, based off our Snapshots collection. We asked a few extra designers to play around with this new collection, and I volunteered to try my hand at a fabric project as well. I should start out by letting you all know that I am NOT a sewer. I made one of these pillows a few months ago, and I’m pretty sure that was first time I had ever used my sewing machine for something other than paper. That being said, this ruffled pillow is something very do-able, as long as you know how to do a straight stitch on a sewing machine. I had seen a lot of “envelope” pillow covers on Pinterest, and decided to try that method. It’s so easy to do, and I love that you can switch out the covers for a new look, instead of buying and storing new pillows all the time. To start, you need to know what size pillow you’ll be covering, whether you purchase a new pillow insert from the craft store or chose to cover a pre-existing pillow. I’m using a 16” pillow insert for this project. You’ll start by measuring your pillow insert and adding 1 inch to the height and the width. My pillow is 16” square, so I cut a 17” x 17” piece. Cut that from your material, which will now be your front panel. I choose to use plain white fabric for the main part of the cover. The ruffled fabric will get sewn onto that white fabric. Next, we want to cut the panels for the backside of the pillow. You’ll want to take the width of the front panel and divide it in half, and then add 3 inches to the total to get your needed width. The height remains the same as the front panel, but the width will be different. And you’ll cut two of these panels for the back. My front panel was 17” wide; divided by two gave me 8.5”, to which I added 3”, and my total width was 11.5”. For each of the back panels, you will want to take the length that will be overlapping (should be the longer edge, which is the same height as the front panel), fold the edge over about ½” and sew the seam down. Once that’s done, you can put all three panels to the side. Now it’s time to make our ruffles. I chose a handful of the new Snapshots fabrics from Riley Blake Designs to use on this pillow. You’ll want to be sure your strips are at least double the size of the pillow in length. So for my 16” pillow, I made sure my strips were at least 32” in length. Ruffling them will make them a lot smaller (I speak from experience!). There’s two different ways you can create your fabric strips. I love to simply tear my fabric strips. It’s quick and easy to do, and I love the look of the frayed edges. I did do a little measuring, just to insure that my strips were about the same width. I placed my fabric on my cutting mat, and made small cuts into the fabric every inch and a half. You could always go wider or narrower (1 inch, 2 inches, etc), depending on what you like. The small cuts give you a spot to start tearing. The first time I thought to try tearing fabric, I thought for sure it wouldn’t work. It’s so easy to do. I just held up the fabric, grab my 1 ½ inch piece where I made the cut, and pull down, tearing the fabric towards me. It’s crazy how straight it actually tears, if you just tear straight down. You’ll have lots of loose strings, so just pull those off your torn strip and toss them. If you’re not into the torn strips, you can easily just cut straight edged strips of fabric. I highly recommend purchasing a rotary cutter and a large, clear ruler. I only recently got mine, and I’m not sure how I ever tried to cut fabric without them. When it comes to ruffling the fabric strips, I’ve heard there’s an easier way than how I’ve been doing it (my mom informed me!). But here’s how a non-sewer, who is winging this fabric stuff, went about it. I simply ran each fabric strip thru my sewing machine, using a straight stitch, ruffling up the fabric as I fed it thru. I went pretty slowly, so that my “ruffling” didn’t get too messy or crooked. And it’s definitely not the neatest ruffling job, as some sections are more bunched up and some aren’t. But it’s totally fine for me. Next up, it’s time to pin the ruffled fabric strips to the front panel. I played around with the fabric strips, until I came up with a pattern that was pleasing to my eye. I arranged the strips fairly close to each other, even overlapping each other just a tad. If you end up with a gap, you’ll just need to make another strip to fill it in. I got lucky and had just enough, totally by guesswork. I then pinned each strip in place, using about 5-6 pins per strip to make sure they stayed straight and evenly spaced. Then it’s time to sew the strips. I did a straight stitch along each fabric strip, roughly going over the stitch that was already there to “ruffle” the fabric, and pulling out the pins as I went along. I didn’t worry about making my stitching super neat, and I didn’t even worry about changing thread colors. Although you could change thread colors, if you like your thread to match the fabric. Now we need to pin the back panels to the front panel. You will want to have the right sides facing inward. Lay your front panel down, ruffled fabric strips facing up, and then lay one of the back panels on top, along one of the side edges, with the right side facing down. Then lay the second back panel on top, along the opposite side edge, so that it’s overlapping the first back panel. Make sure your sewn edges are in the center of the pillow, and not on the outside edges. Pin the entire cover, around the edges. Use enough pins to keep it all together, since there is some bulk from the ruffled fabric. Then sew around the entire pillow cover, about ¼” from the sides. Next, you’ll need to turn it right side out. And there you have it. A fun ruffled pillow cover. All you have left to do is stuff your pillow insert inside the cover. Here’s a look at the back of the “envelope” style pillow cover. I haven’t made many pillows in my lifetime, but I do seem to remember leaving one end open and having to hand stitch it closed once the pillow insert was inside. This is such an easier way to do things. While a decent amount of time did go into this fabric project, it was really very simple to do. And making these envelope pillow covers, without the ruffles, would be a super fast project. And would look cute with any of these fabrics. We've been featuring fabric projects, all using the new Snapshots fabric collection, all this week. So head over to the Bella Blvd blog to see a variety of fun projects from earlier this week. I finally have something to share with you all. Yay! I was excited to get an email from Heidi Sonboul a few months ago, inviting me to be the October guest designer for Chickaniddy. I've met Heidi a few times over the years at past CHA's, and it's been fun to see her start up her own company over the last year or so. She sent me her new Scrumptious collection to work with, which is a fun fall collection. I'm sure I've said it before, but I'm a sucker for fall colors and fall products. Which is strange, since I very rarely have fall photos, as we don't have a typical "fall" season where we live. After digging around in my photos, I came across these photos I took way back when, of one of my little daycare babies. It's fun to look back on these photos, knowing that little Adyson is now a full eight years older than in these photos! 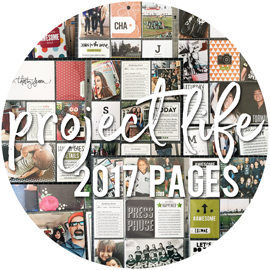 I started out by printing out my photos in a photo collage, allowing me to easily fit six photos on the page in a clean and organized way. I usually tend to figure out my title towards the end of my pages. Since I knew I wanted to include the "Scrumptious" sticker in my title, I decided to work on my title first. I die cut "Fall", using my Cameo, from the burnt orange patterned paper and spritzed it with some white misting spray. One of the patterned papers had four 6x6" blocks of solid colors to match the collection. These were perfect to use for die cutting, and I used the brown block to die cut the outline for the word "Fall" and "baby". Once again, my favorite chunky block and cursive word combo for a title. I went with pink, green, and brown patterned papers to tie in with my photos. And then threw in the burnt orange and yellow to make it more fallish. I die cut a thin little circle border from the green star patterned paper, to add a bit of interest next to the photo collage. I love all the little frames in the die cut package that coordinates with the collection, and combined two of them to hold my journaling. I thought about printing my journaling out in a little block to go behind the frames, but decided to do my normal journaling strips so that some of the pink misting would still show on the background of my page. 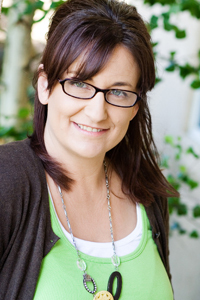 You can check me out over on the Chickaniddy blog, where I'm being featured today. I have two layouts up there today, but I'll also be sharing the second one here next week. And then I'll be visiting their blog again later this month, to join in on their sketch feature.